Last Friday I went to Frankie & Benny's for lunch with one of my best friend Aymee. We are off to Paris next week so we planned to meet up a few days early just so we could get our tickets, do a bit of shopping, get our Euros sorted and plan the time we are going to meet on the day...etc...You get what I mean! We met during lunch hours and decided to go and treat our self to some yummy food! Frankie and Benny's is a chain of Italian - American restaurants in UK as well as nationwide. The menu consists of starters, main courses - pasta, pizza, burgers, classic fish & chips, wraps and desserts! You can view their full menu on their website. The background music they play is mainly Italian with a bit of jazzy vibe to it. I love the music they play! It seems to cheer me up and make the dinning experience more pleasurable! This is one of the starters we ordered. There was plenty of dough balls for us to share! 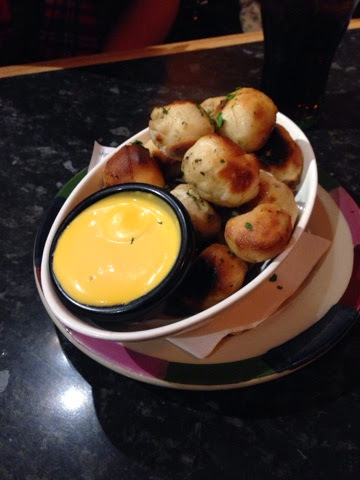 The cheese sauce on the side was delicious, it added that extra richness to the flavour of the garlic dough balls. We both ordered the same main course which came with house fries. The cheeseburger was topped with lettuce, tomato, red onion, cheese, dill pickle, mayo and a burger relish on the side. The burger itself was very large, we both could not finish ours (maybe because we had 1 and 1/2 starters!). In all honesty I could not taste the dill pickle which is good as I am not into sauces. I did not even touch the relish sauce instead opted to have my classic ketchup. The burger meat was not over cooked or undercooked, it was definitely more restaurant style compared to a fast food burger. The fries were very nice and crispy and they gave plenty compared to some places where you only get a hand full! We also had soft drinks which were unlimited refills so that was a bonus! By this time we were really full, but we already had placed our order at the beginning so it was too late to say anything. The dessert we shared between both of us - thank Lord for that! I could of not ate it all by myself! 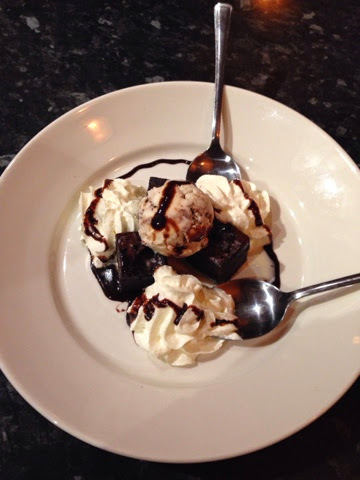 It came with a few pieces of chocolate brownies which were warm and moist topped with cream as well as ice cream and warm chocolate sauce. The brownies were lovely and not dry or solid hard. The cold ice cream added that extra bit of 'uffness'. This dessert is made to perfection! I definitely would recommend Frankie and Benny's to everyone! I can not wait to go back and try out other dishes from there! The staff were also very helpful and friendly. The service was quick and there was no waiting around. I had the potato skins at F & B's last week and they're gorgeous aren't they! Love a good old food post! I found your blog via the #bbloggers blog hop btw! Would love it you could visit me back at www.lazydaysbeauty.com! They are! Thank you! I will defo check out your blog :) and thank you for visiting!